My great-great-great-grandfather was James Farquhar (1813/14-1892). I have not yet seen any specific date records of either his birth or death. His parents married in February 1813 in Person County, North Carolina and census records indicate his birth sometime between 1813 and 1814 in North Carolina, although his tombstone lists his birth as 1820. A marriage index provides evidence of a marriage between James and Barsheba McGuire on August 22, 1833 in Tuscaloosa County [the 1833 marriage date does not go well with an 1820 birth date for James – he would have only been 13 at that time; however, it does fit with subsequent census records]. 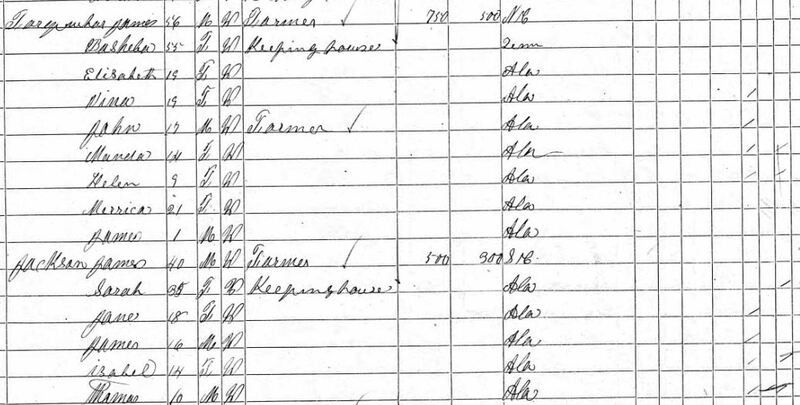 There is an 1840 census for James Farquhar in Tuscaloosa County that showed them still in Tuscaloosa County. The tic-mark census was for a male and female between the ages of 20-29 (James and Basheba), one son under 5 (Andrew), one daughter under 5 (Mary “Polly”) and one daughter between 5 and 9 (Sarah – my great-great-grandmother). By the 1850 census James and Basheba and their growing family had moved to Fayette County. In addition to James and Basheba and Sarah, Polly and Andrew, they also had Martha, James, Elizabeth and “Sis” or America. From September 1839 through June 1858, James Farquhar and/or his father purchased land in Tuscaloosa and Fayette Counties; James the son had married in Tuscaloosa County in 1833 so it is feasible he was ready to purchase land by 1839; however, his father of the same name was still living until 1859. A spreadsheet pulled from the Bureau of Land Records shows those purchases: The Tuscaloosa land is some distance away (between Tuscaloosa and the Fayette County line) but the remaining land is all contiguous. 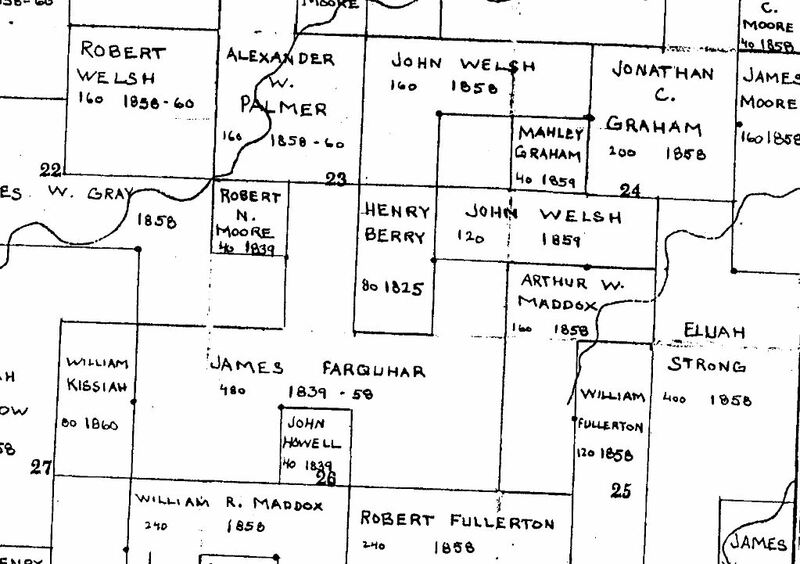 Someone has a website with plat maps of some of the Sections in Fayette County and the one showing James Farquhar’s land, as well as his son-in-law (and my great-great-grandfather) Robert Welch’s, is available [Robert’s land is top left and James’ land is center/left]. Between 1850 and 1860, three more children were added to the family: Lavina in 1851; John Thomas in 1853; and Amanda in 1855. 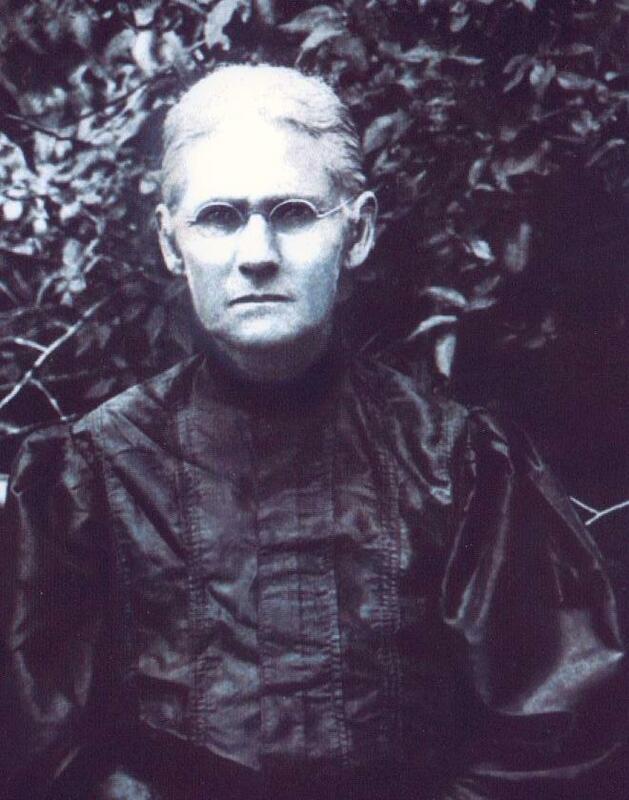 One more child, Cornelia Helen, was born in 1860 but not enumerated until the 1870 census. The 1860 census listed James as a farmer with property valued at $1,200 and personal property also valued at $1,200. The Civil War began in 1861 and James’ family was deeply wounded by the war. He had three sons and two of them were old enough to fight for the Confederacy and both of them died. Additionally, his daughter Martha had married William David Caraway who also enlisted and died. His son-in-law, Robert Welch, had died in 1861 prior to the War. The War had taken such a huge toll on the male population of the south and Alabama did a state-wide census in 1866 that was clearly needed because the Federal census taken in 1860 would not have been at all accurate. The 1870 census gives a small indication of the economic impact on the area – where James’ property values were $1,200 land and $1,200 personal in 1860, in 1870 his property values were $700 land and $500 personal. James’ wife, Basheba, died in 1882. He married again in 1886 to the widow Nancy Tierce Falls. He died six years later in 1892 and was buried at Mount Pleasant Baptist Church Cemetery, on land he had apparently donated to the church for the purpose of providing a burial grounds. He was buried near his wife, Basheba, his parents and a number of his children and grandchildren. 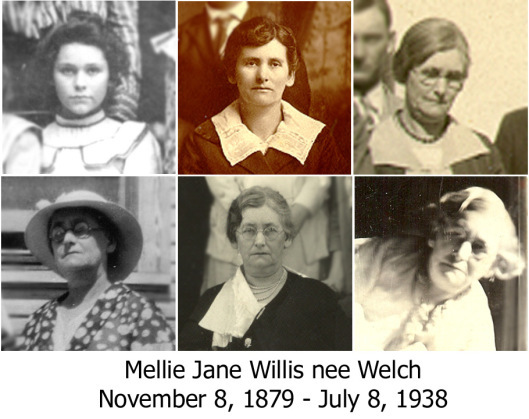 My grandmother was Mellie Jane Welch. Unfortunately, I never knew her because she died two years before I was born; in fact, I don’t even remember seeing a photograph of her other than a casket photo until I began working with Kay on our family history; this was true of all my grandparents. It is not easy to learn much about our female ancestors because, for the most part, records of them are either with them as children of their parents or as the wife of their husband. Keeping house, doing laundry, and raising children doesn’t leave much of a unique paper trail. In this, Mellie Jane was a typical female of her generation. 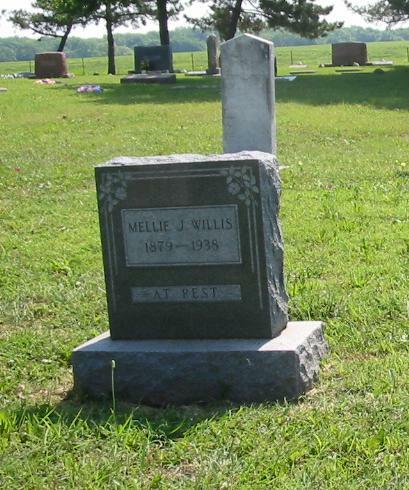 Mellie was the first of nine children of William Thomas Welch and Mary Monroe “Mollie” Sanford and was born in Fayette County, Alabama November 8, 1879. The 1880 census shows the family listed with the surname spelled as Welsh [her father’s sister’s death record also listed their father’s name as Robert Welsh]. This reveals something of the times: people either weren’t sure how to spell their own family names and/or the enumerators spelled it as they heard it and, as literacy improved, families seemed to settle on one spelling or another, including variant spellings within the same family. I clipped a larger portion of this census because it reveals something else about the time period – people tended to live near extended family. John Sanford above them was Mary’s uncle, brother to her father, and Sarah Gladden was her cousin and daughter of John Sanford. The census also indicated that Thomas and Mary could not read or write, although Sarah and John Gladden could and John Rufus and his wife, Emma, could. Additionally, Mellie was listed as Jane in this census; I do not know if she often went by the name of Jane or if this was an isolated instance. Because the 1890 census was lost in a fire, the only other record we have of Mellie Jane with her parents and siblings is the 1900 census. This census confirms that William and Mary did not read or write but that they were providing education to their children: the columns reading ‘Yes’ for the children indicate they could read and write and they had attended school (5 months for all but James who had attended 8 months of school). Mellie who was 20 and presumably through with the education she would receive could also could read and write. She and her family lived on a farm they owned free of a mortgage [the O and F in the right columns]. In contrast to the times, this census reveals a positive aspect to her family of origin – her mother was listed as the mother of nine children, all of whom were still living. A large number of families in this time period had suffered the deaths of both children and/or parents. On a trip to Alabama, one of my second cousins let us scan a photo he had of several of the young people in Fayette County taken sometime around 1900. He had a copy of it because two of his wife’s grandmothers were included in it; however, it also included my grandmother, her sister Dena, and Rufus Willis (Dena’s future husband/brother to Mellie’s future husband). Mellie is second from the right on the first row; Dena is in the center of the first row; Rufus is far left on the second row. The next record we have for Mellie is a marriage index listing her marriage to my grandfather, Zedic Hamilton (Zed Hamp) Willis on November 15, 1900. Although Hamp’s father was a Baptist minister, they were married by his brother John’s father-in-law, William Franklin Gilpin, who was also a Baptist minister. The 1910 census for Itawamba County, Mississippi provides evidence of some of the events in the lives of Mellie and Hamp. It also supports what I said about the frequency with which families suffered deaths of children, parents and/or siblings. The columns just left of the center confirm that Hamp and Mellie had been married nine years and Mellie was listed as being the mother of six children, five of whom were still living. 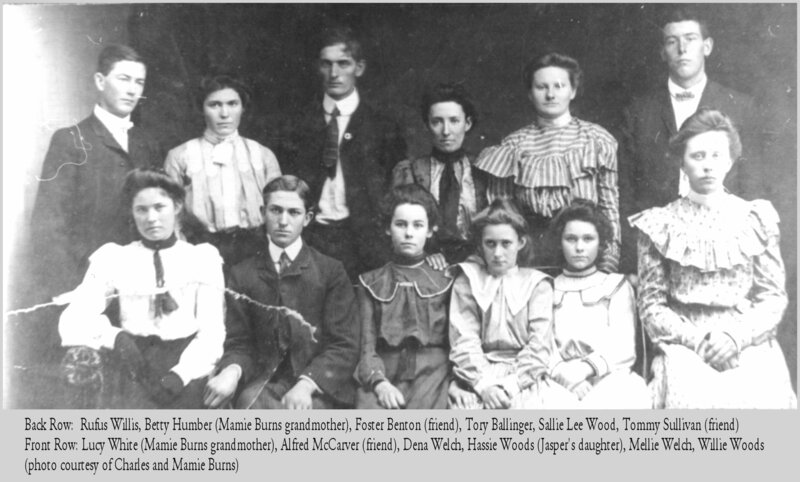 My Aunt Madge provided a family group sheet that identified Hamp and Mellie’s first child as a daughter named Mary Eunice; she is the one missing from the 1910 census. We do not know when she was born, when she died, how long she lived or what caused her death. Their other five children were William Franklin (7), James Thomas [my father] (6), John Hall (4), Earnest (3) and Ruth (1 1/2). Johnnie was born in Mississippi in 1906; since my father was born in Fayette County, Alabama in 1904, that would indicate they moved from Alabama to Mississippi between 1904 and 1906. The far right column indicates they were renting their farm. Not shown on this clip but also enumerated on the same census page were Mellie’s brother, James William, his wife, Pearlie, and their 3-year old daughter. Because I never knew my grandmother and never even saw pictures of her prior to about 2000, I am very grateful to have discovered a few of them. One we have been unable to identify when and where it may have been taken. The confusing elements are the long dress, which would place the time period as early, her double chin but with dark hair indicating she is probably between perhaps 33 and 38. Her face in this photo is similar to one taken in the 1930s but her hair at that time had quite a bit of gray in it. Hamp and Mellie appear to be holding a female child of six months or so. The family group sheet provided by Aunt Madge indicated their last child was a daughter named Rachel who was born about 1914 and who died about 1914. Mellie would have been approximately 35 at the time of Rachel’s birth, which might fit the time frame of this picture. As can be seen by the 1920 Monroe County, Mississippi census below, two more children were born to the family between 1910 and 1920, Rex and Leroy. They were still in Mississippi in 1910 when Rex was born and they were back in Fayette County when Leroy was born. Hamp’s 1918 World War I draft registration indicated they had moved to Marion County, Alabama as did a 1919 Quit Claim deed for their Itawamba County, Mississippi property, which was apparently signed and notarized in Marion County. The Quit Claim deed also provides evidence they bought property following the 1920 census when they were just renting. According to this 1920 census (the columns to the left of center) they purchased their farm with a mortgage (the O and M). All of the children but Leroy were attending school. My father told me he left home when he was 15; since he was 15 on this census, he must have left soon afterward. From snippets of information gleaned from listening to my aunts (all daughters-in law), the family must have moved to McClain County, Oklahoma about 1925 and lived someplace between Noble and Purcell. My father, although he considered himself to have been on his own, apparently wished to be near his family and so moved to Oklahoma; he didn’t graduate from high school but, according to Aunt Ruby, he did attend a business college in Oklahoma City. 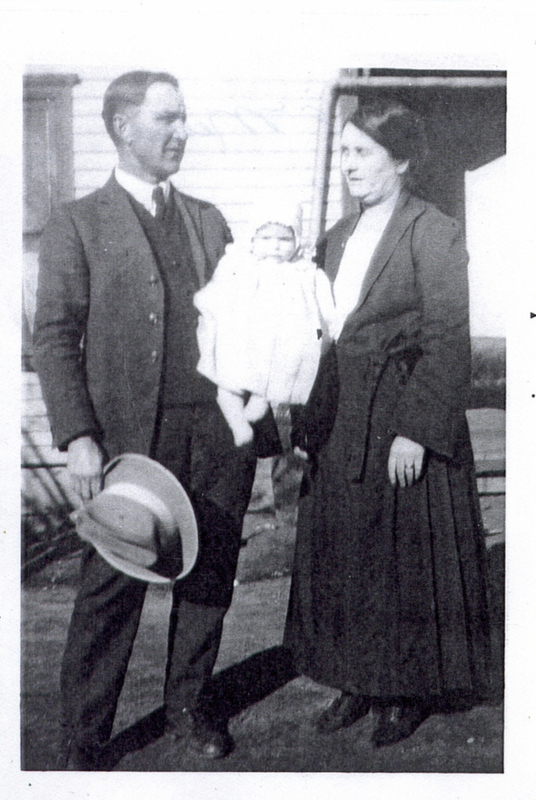 Sometime before the 1930 census, Hamp, Mellie and Ruth, Rex and Leroy all moved to Hockley County, Texas in the small community of Smyer. Franklin was already married, as were Johnnie and Ernest and they all remained in Oklahoma. The R in the first small column indicates Hamp was renting his farm. Ruth, Rex and Leroy all met their spouses while living in Smyer. My father, who was enumerated once again with his parents, must have been visiting or passing through after leaving his job with the Merchant Marines. I have mentioned in a previous blog that Hamp and Mellie liked to go to ‘singings;’ in that blog I posted a photo of them on their way to a day of shaped note or Sacred Harp singing as well as explaining what is meant by Sacred Harp singing. A 1936 Oklahoma City city directory listed Hamp and Mellie as living in Oklahoma City although they didn’t live there long; Franklin and his wife and children as well as daddy were all living at the same address. Hamp and Mellie soon moved to Noble in Cleveland County, Oklahoma. 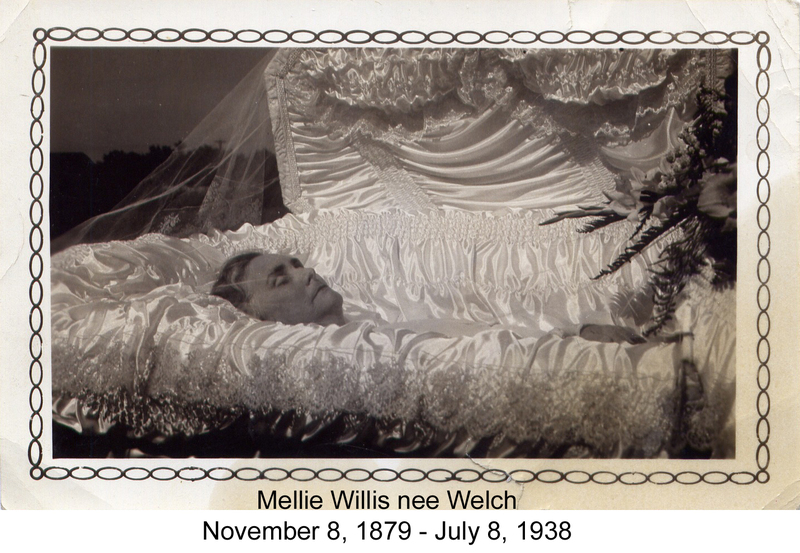 My daughter, Kay, who has done several through-the-years photo compilations of her grandparents and great-grandparents did one of Mellie, which she used in a blog about Mellie. The first photo on the left is a crop of the group photo above and the last was taken a few months before her death in 1938 – though not visible in this crop, she was on her bed with her granddaughter, Jane, who was an infant. Though in photos she generally exhibits an aura of sadness, I know my daddy loved her deeply and that he was loved by her in return; my Aunt Ruth indicated daddy and Mellie Jane had a very special bond. In spite of that bond, I don’t remember him ever speaking of her. The only picture I had ever seen of her prior to these was, as I said, in her casket. She died at 58 of rectal cancer and was buried at Noble IOOF Cemetery with Zed buried next to her four years later. My father, Franklin, Johnnie and Ernest and their wives are buried there as well. Because I never knew her, I would love to hear stories about her life and personality from any one who knew her. I have a few cousins who were older than I was and had a chance to spend time with her and to experience a grandmother’s love from her. There may be photos available that express more of her life, character and interests than those I have seen. Sharing what we know about our ancestors can be a real treat to those who do not yet know. Please feel free to add any stories, comments or photos to add more detail to her life.